View of “Martin Scorsese,” 2016, Museum of the Moving Image, Astoria, New York. Photo: Thanassi Karageorgiou. GEORGE LUCAS IS BUSY DESIGNING his Museum of Narrative Art, a Xanadu for his legacy. Francis Ford Coppola is now a gray gentleman vintner with a sideline in independent films. William Friedkin pungently adapts Tracy Letts stage plays when he’s making anything new at all. Paul Schrader has gone back underground, working fast, cheap, and dirty, venting spleen on Facebook in his downtime. And Peter Bogdanovich is . . . well, you know. Of the leading lights of the so-called New Hollywood who came to prominence in the late 1960s and 1970s, only Steven Spielberg, Terrence Malick, and Martin Scorsese have shown the desire and ability to continue to command big budgets and to put challenging—or, to some minds, taxing—film art in front of the widest possible public. It is strange to think of a filmmaker like Scorsese, his work still so violent, vital, and totally capable of getting up the nose of the holier-than-thou cultural commentariat, as making sense within the hush of a museum, but here we are. On the eve of the release of his twenty-fourth fiction feature, Silence, Scorsese is being honored with a complete career retrospective and standing gallery exhibition at the Museum of the Moving Image in Astoria, in Queens, about twenty minutes on the Grand Central Parkway from Corona, where he lived until the age of eight. Passing into the upstairs galleries through a screening space where four projectors throw coordinated clips from Scorsese’s films onto the wall, you may be greeted by a fusillade of brain-spraying headshots, a staccato of profanity. Scorsese may have been museumified, but he has not been domesticated. 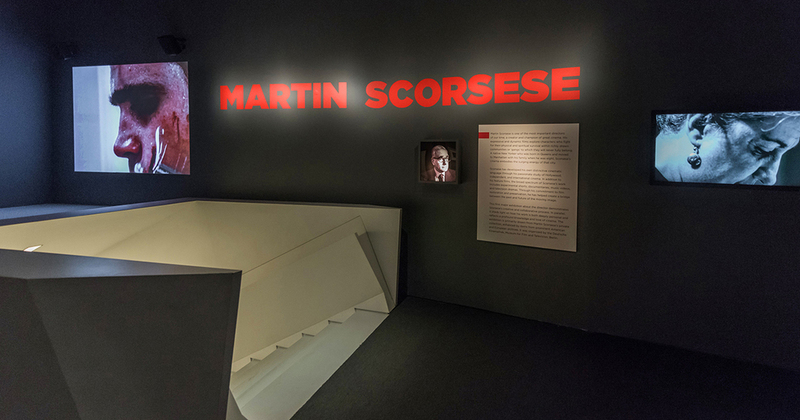 The show, which originated at the Museum für Film und Fernsehen in Berlin and has traveled extensively since, brings together objects relating to the entire span of Scorsese’s half-century-plus career—from correspondences around securing the financing for his gruesome early short The Big Shave (1967), which is seen on loop as you enter the third-floor galleries, to a vitrine filled with storyboards, annotated script pages, and props from the Silence shoot. The film––based on Catholic author Shūsaku Endō’s 1966 novel about Portuguese Jesuit missionaries on a clandestine mission in seventeenth-century Japan during a period when the Shogunate was zealously persecuting the significant population of foreign proselytizers and native Christian converts––is among Scorsese’s most scourging and emotional, never more poignant than when evoking the preciousness of scarce sacred images in a land where they’ve been forbidden. Similarly, many of the most touching objects on display at MoMI relate to Scorsese’s childhood, these adding up to the portrait of a frail, asthmatic young blue-collar aesthete living in straightened circumstances in the apartment of his garment district–worker parents on Elizabeth Street in Little Italy, snatching his glimpses of horror and beauty wherever he could. There is the wood cabinet television set that showed the Million Dollar Movie; the teenage Scorsese’s carefully indexed box of 45s, including the Cellos’s “Rang Tang Ding Dong (I Am the Japanese Sandman),” used some forty years later on the sound track of Bringing Out the Dead (1999); a child’s crayon storyboard for “A Marsco Production” in “Marsco Color” and “Cinemascope 75MM” of sword-and-sandals epic “The Eternal City,” with Marlon Brando leading an imagined all-star cast; and the dining room set and scattered wall decorations (family photos, the Mona Lisa, Gilbert Stuart’s George Washington portrait) familiar from Italianamerican (1974), Scorsese’s intimate, good-humored documentary about his parents. Martin Scorsese, The Wolf of Wall Street, 2013, 35 mm, color, sound, 180 minutes. Jordan Belfort (Leonardo DiCaprio). The cell breakdown in Raging Bull, you may recall, is followed not long after by a quotation from the Book of John, and Scorsese’s “Lonely Heroes” are very often alone with a God who either refuses to speak to them (“God’s lonely man,” Travis Bickle in 1976’s Taxi Driver) or, more terrifying still, does (the sermonizing Pentecostal psycho Max Cady in 1991’s Cape Fear, who announces that “every man carries a circle of hell around his head like a halo”). Scorsese’s own Italian-Catholic upbringing is important not only to understanding his personal loyalties and thematic preoccupations, but also to understanding the role he plays in American popular culture—revered, to be sure, but still very much able to play the irritant, as testified to by the brouhaha incited by the release of his Rabelaisian knee-slapper The Wolf of Wall Street (2013). Scorsese’s work bears all the marks of someone raised in thrall to mysterious images—those of the church and those of the cinema—and mysterious images can still pose a threat in a country that, some four hundred years removed from its Puritan origins, often seems much more comfortable with narrow definitions provided by the written word than tricky, deceitful, transfixing pictures. With the 1988 release of his adaptation of Nikos Kazantzakis’s novel The Last Temptation of Christ, in which Willem Dafoe’s Christ is seen to imagine himself living and lusting as a family man, Scorsese found himself smack in the middle of the 1980s Culture Wars—the MoMI walls feature a reproduction of a flyer billing Scorsese as “WANTED: For Sacrilege,” as well as a letter of support from someone at the First Baptist Church in Evanston, Illinois. (“I must say that I believe this is a film Jesus would have liked.”) More than just a director, he became something like the public spokesman for film as art in America, and as so many young movie-lovers have, I suppose that as a young man I must have hero-worshipped Scorsese. When the police department in my hometown, Cincinnati, charged a gay bookstore for pandering obscenity by renting a copy of Pier Paolo Pasolini’s _Salò, or the 120 Days of Sodom (1975) to an undercover officer in 1994, Scorsese was in the thick of putting together a case for the defense, and you don’t soon forget a thing like that. Notions of sin (both of commission and omission), seduction, and final East of Eden exile are inextricable from Scorsese’s cinematic crucibles, which time and again strap you into the hot seat, forcing you to squirmingly identify with profoundly damaged men. (Yes, they are usually men, which befits a body of work that is an extended study in machismo as a grotesque, disfiguring disease.) Like Andrew Garfield’s would-be Jesuit martyr in Silence, his sense of mission renewed by contact with the backbreaking poverty of the Japanese peasantry, Scorsese loves to go down among the shunned and despised—to mix with the moral lepers, to wash their sores, to chance contagion. A straight line can be drawn from Yōsuke Kubozuka’s Kichijiro, the serial-apostatizing backslider in Silence, to De Niro’s Johnny Boy in Mean Streets. Peopled with such irredeemables and full of beckoning lures and snares, Scorsese’s films don’t provide the audience a buffer of safe pity or contempt—in watching Silence, you are tested and implicated along with the priest, a mutely rubbernecking witness to a terrible Theater of Cruelty spectacle. It’s a gorgeous, troubling addition to Scorsese’s corpus, which is nothing if not a monument to visual allurement and moral turpitude. And with popular culture glutted by smug know-it-alls, self-styled Nice Guys, and patient explicators, a premium must be put on artists like Scorsese who are still willing to get lost—to venture into a forest dark, away from the straightforward pathway. “Martin Scorsese” is on view through April 23, 2017, at the Museum of the Moving Image in Queens, New York. A related film program, “Martin Scorsese in the 21st Century,” runs December 16 through 30.